Deividas Taurosevicius gave his wife the perfect birthday present Friday. Taurosevicius gift wrapped his fifth-straight featherweight title defense by submitting Guillermo Serment with a rear-naked choke at 2:20 of the second round at Lou Neglia’s Ring of Combat 44 held at the Tropicana Casino and Resort in Atlantic City. All five of Taurosevicius’ title defenses have ended via submission. In the co-main event, hard punching Brendan Barrett won the vacant heavyweight title by destroying Silvio Santos in just 33 seconds. It was the fourth title – all from different organizations — in as many fights for the 31-year-old from Tuckerton, NJ. The title fights headlined a 10-fight card that included the return of a UFC veteran and the long-awaited debut of a former Division I wrestling prospect. 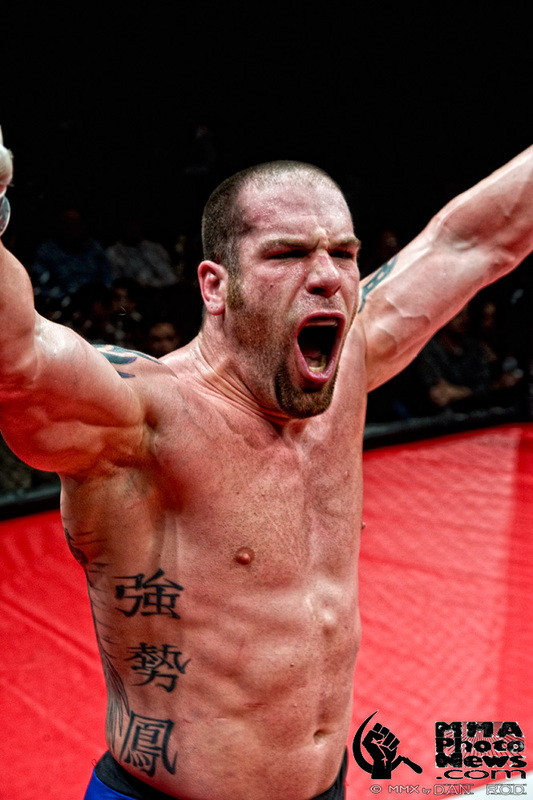 None of the combatants, however, entered the cage with as much momentum as Taurosevicius. With his wife Simona sitting cageside on her big day – and his boxing coach, Jerry Harvey, having celebrated his birthday Thursday – the Long Island fighter known as “Taurus” pleased everyone in his camp by dominating Serment from the opening bell. Taurosevicius said that though he figured the fight would end in a submission – 13 of his 17 victories have – he had to be patient against Serment, who is 4-8 and fights out of Chicago. Serment had no answer for Taurosevicius’ ground game, with the champion riding his back and delivering punches from the top position. Though Serment landed some punches to start the second round, Taurosevicius soon got the takedown, took his back, and locked in the rear-naked choke. The end came at 2:20 of the second. Taurosevicius, a veteran of Bellator and the WEC, said he hopes his title defenses do not go unnoticed by the larger MMA organizations and he still hopes to compete at the highest level. The fighters exchanged punches in the center of the cage to open the fight, but a hard left hook stunned the Brazilian and sent him reeling backward. Knowing that his opponent was in trouble, Barrett pounced, landing a right hand that floored Santos (4-3), where he finished him off with several well-placed blows. Barrett said that though he knew very little about Santos going into the fight, he was ready to fight three rounds. UFC veteran Mike Massenzio (13-9) dropped his second consecutive fight in the ROC cage, and his fourth straight overall. Ariel Sepulveda (6-6) earned the win at middleweight with a rear-naked choke at 1:14 of the third round. Massenzio successfully mixed his wrestling with strikes in the first round, but Sepulveda turned the tide in the second and eventually wore his opponent down. Jared Platt made a long-awaited successful cage debut, earning a second round TKO when Mitch Whitesel was forced to retire with what appeared to be a shoulder injury. Platt, once a nationally ranked freestyle wrestler and a jiu-jitsu specialist, used his ground game to smother Whitesel, who entered the bout with 40 fights under his belt (17-24). In the other main card fights, Levan Makashvili won a comfortable decision against Anthony Facchini; Joshua Key slipped past Robby Plotkin in a spirited welterweight bout, with all three judges seeing it 29-28; Anthony Montanaro won via TKO when the cageside doctor stopped his fight against Jerome Isip in the second round; and Noah Faunce picked up a TKO victory against Ryan Contaldi at 2:09 of the first. Fighting on the undercard, Joseph Ray won via split decision against Yordani Hemandez, and Willie Hosch TKO’ed Aaron Freedman in the first round.